No, don’t make that purchase yet. Read these 2500 PSI Pressure Washer reviews first and get the best product that’s worth the money. Have you ever been in a situation wherein you want to purchase the most advanced pressure washer there is, but your budget doesn’t allow it? Well, you’re not the only one. I have been in this situation a lot of times, whether I’m buying a new cleaning equipment or merely buying a few household stuff. Well, the price doesn’t always speak about the quality of a product. So, if you’re buying a 2500-PSI pressure washer for the first time or want to change to a new one, I highly encourage you to read the 2500 PSI pressure washer reviews and tips below before making a final purchase. I also include great-value choices that will surely make every dollar you spend worth it. Too Lazy To Scroll Down The Top 2500 PSI Pressure Washer Reviews? Here’s a quick rundown of the best choices in the market! Why Choose 2500 PSI Pressure Washers? It’s understandable that when you buy a machine with a hefty price tag, you want to make sure that you are buying the right product at the right price. The question I want to answer in this section is whether the 2500 PSI pressure washer is the right unit for you. According to pressurewashersdirect.com, one of the leading and trusted pressure washer websites, a 2500 PSI-pressure washer is considered as the perfect unit for professionals or those looking for a machine that can operate at a professional level. The website also shares that 2500 PSI units are mostly coupled with high flow rate that can go as high as 10.0 GPM to make the cleaning power even stronger. If you wish to stick to medium flow rate, then no need to worry since most 2500 PSI pressure washers can actually be purchased with GPM levels ranging from 1.0 to 10.0 GPM. Thus, giving you various cleaning capacities. Another thing that makes the 2500 PSI pressure washer a great buy is that it is very versatile when it comes to different applications. Pressure washer units with 2500 PSI levels usually belong to high medium or heavy-duty category. This entails that they are designed to tackle the toughest stains and dirt on any surface. Hot water pressure washers are the best choice for removing oil and grease from a surface. So, if you intend to buy a unit that can do both cold and hot water cleaning, then you pretty much have a lot of options in the 2500 PSI pressure washer group. I couldn’t believe it at first that such powerful unit can be bought at a price below $500. But guess what? It does exist. Of course, you cannot expect very well-known brands on the list, but after doing a bit of research I found out that some brands in the below $500 price range are reliable and are actually savvy buyers’ choice. And if you are lucky, you might catch some popular brands on sale and score a brand new 2500 PSI pressure washer at a bargain price. Here, I will discuss the notable features of most 2500 PSI pressure washer units. They are usually identified with these four features, namely: gas-powered, with welded steel frame, heavy and bulky structure, and a flow rate not less than 2.3 GPM. Most heavy-duty pressure washers are gas-powered, and this includes the 2500 PSI pressure washer machine. So, why are most 2500 PSI pressure washers gas-powered? To produce a certain level of cleaning power, a machine has to have a high level of pressure and flow rate. Now, most electric pressure washers can’t handle high pressure; they don’t have the strength to tackle stubborn dirt and stains. The gas pressure washers, on the other hand, can operate at a higher level of PSI, making them the best choice when it comes to thorough cleaning, specifically among professionals. It’s no secret that 2500 PSI gas pressure washers are more difficult to use because of their heavy and bulky structure. Whilst electric pressure washers have light and compact design, heavy-duty pressure washers, like 2500 PSI pressure washers, are heavy. Since they are gas-powered, they need a tank wherein the fuel is stored; this adds the bulkiness of the unit too. To resolve the issue of difficult operation due to heavy and bulky structure, most manufacturers of heavy-duty pressure washers include a welded steel frame with wheels in the design. The frame and wheels do not only make the transportation of the unit easier but the frame also protects the engine for a long lasting durability. I mentioned earlier that 2500 PSI pressure washers can actually be purchased with varying GPM levels. However, most 2500 PSI units are being sold with a flow rate not less than 2.3 GPM. This is because most buyers prefer to pair high pressure with high flow rate to create an efficient cleaning power. Check out these 2500 PSI pressure washer reviews and find out my top choice below! I can't emphasize enough how important it is to get a pressure washer that not only performs well but also takes care of your posture. When pressure washing, we most likely bend our back to operate the machine easily. Thus, it is important to get a pressure washer that has a comfortable grip and an easy-to-pull trigger when spraying. If you consider the machine's ergonomic design when choosing the best 2500 PSI pressure washer, then Generac 6921 2500 PSI Pressure Washer is for you. You can also pull the spray trigger with less effort, thus reducing muscle fatigue when using the machine. Features an OHV horizontal-shaft engine, which puts the pump at the same level as the engine. Thus, hose connection is a lot easier. It's engine also has ample power for various cleaning applications. This unit requires regular maintenance, including adding stabilizer to the gas before filling the tank. It produces a lot of noise when operation. It's a heavy-duty machine but is not recommended for heavy commercial purposes. If you are on a budget but still want to score a good 2500 PSI Pressure Washer with ergonomic spray wand, then I recommend the Excell EPW1792500 2500 PSI Pressure Washer. For less than $500, you can already have this buyer's choice 2500 PSI pressure washer. Let me tell you one thing about this machine. 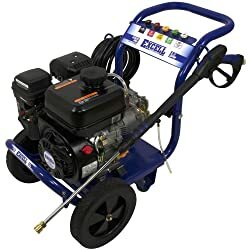 Excell EPW1792500 2500 PSI Pressure Washer features a brass head pump, which makes it long lasting and suitable for higher pressure application. One thing that I look for when choosing the best 2500 PSI pressure washer is its pump's quality, and Excell EPW1792500 2500 PSI Pressure Washer surely doesn't disappoint. It's a heavy-duty pressure washer with high-quality pump and engine. Its handle is collapsible, making it easier for you to transport and store the unit. The ergonomic spray wand reduces fatigue and back pains while using the machine. Uses 179cc Excell gas engine; it's an efficient engine that is CARB compliant (an environmental protection agency) and is very easy to start. No drain plug for the pump; hence, you need to pour out the oil manually. If you fancy owning a 2500-PSI pressure washer machine from a well-known brand, then I have a great recommendation for you. 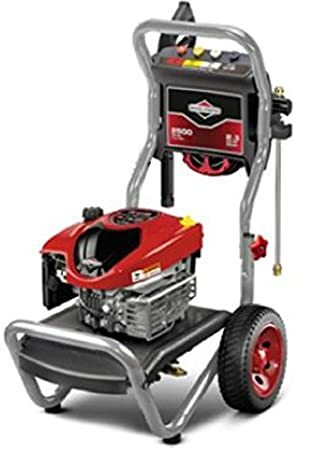 Introducing Briggs & Stratton's offering for the 2500 PSI category, the Briggs & Stratton 20588 2500 PSI Pressure Washer. This powerful gas pressure washer is priced reasonably but isn't short in terms of cleaning power. With a 2500 PSI and 2.3 GPM, it has a total of 5,750 CU cleaning power, which is enough for medium to heavy-duty tasks outdoors. But what convinces me to include this pressure washer on the list? It's maintenance-free axial cam pump, of course! 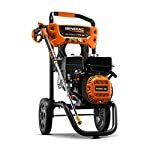 Unlike the first two pressure washers I introduce on this list, Briggs & Stratton 20588 2500 PSI Pressure Washer's axial cam pump requires less maintenance. How? Well, this pump is suitable for higher PSI and GPM. Thus, less maintenance is needed as compared to machine's that uses wobble pump. Also, it is equipped with high temperature thermal relief system. So, overheating is not an issue. This is the best 2500 PSI pressure washer choice for farm owners because of its pressure washer detergent injection system that makes soap cleaning in the farm a lot easier. Got hard-to-reach areas to clean? No worries, this unit has a second storey nozzle kit, which is designed to propel soap and water to the nooks and crannies of your home. It has a fold-down handle design for easy storage. This is not suitable to use indoors. Spilling of fuel while on transport is a high risk, so better empty the tank first. If your budget allows it, opt for a 2500-PSI pressure washer with a slightly higher GPM. This gives you more cleaning power, which, in turn, allows you to have access in different cleaning applications. BE PE-2565HWSCOM 2500 PSI Pressure Washer is the right choice for you if you want a pressure washer machine with a 3.0 GPM flow rate. This one is priced a bit higher though, which is understandable considering that it has a higher GPM. 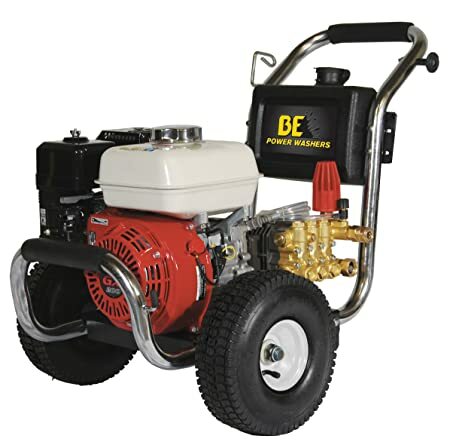 It's a gas pressure washer like the other units on this list and has most of the notable features of 2500 PSI pressure washers like welded steel frame and bulky structure. It uses the Triplex Comet BWDK3027G Pump, which is a common pump used in high pressure and high flow rate pressure washers. This adds to the overall performance of the machine. Comes with 50-ft steel wire braided hose, which is a lot more durable than the average pressure washer hose in the market. Its 10-inches flat-free tires are also foam-filled, making it easier to maneuver in varied terrains. With built-in detergent tank that is easy to fill in and use. It's a bit expensive than the other 2500 PSI units on the list. However, this still belongs to the Below $1000 price range. I understand that budget is not a problem to some buyers. So, if you have the money to invest in an advanced 2500 PSI pressure washer machine, then I won't stop you. However, allow me to share with you my recommendation. I've come across the DeWalt Professional DXPW2500E 2500 PSI Pressure Washer when I was looking for a unit to buy from the DeWalt brand. Unfortunately, this model is too expensive for me. Still, I made my research as it tickles my curiosity as to what makes this unit expensive. Is the high price tag really worth it? 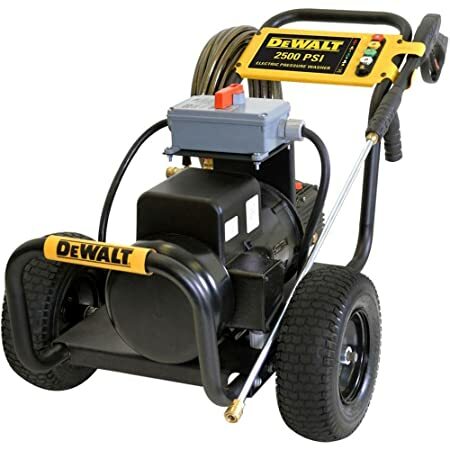 DeWalt is undeniably one of the leading manufacturers of power tools, including pressure washers. The brand is also quite strict when it comes to quality control of the products. These give the brand the right to set a higher price. Moreover, the DeWalt Professional DXPW2500E, as the name entails, is designed for professional use, which explains its higher GPM level. Lastly, this model is an electric unit. But don't doubt its power yet since it uses a single phase induction motor, which has a similar construction to that of a 3-phase motor. Overall, I would recommend this product to those who prefer a high-pressure electric pressure washer than gas unit and also to those who have allergic reaction with fumes. But if you're fine with gas pressure washer, then by all means, choose my other recommendations above. No gas fumes during operation, so it's safe to use indoors; just make sure your power supply is enough to operate this high-power machine. The price is pretty much a disadvantage for me. Unless you intend to use it solely for commercial purposes, then it's a good buy. Single phase induction motor is a bit difficult to start on its own. The best 2500 PSI pressure washer for me is the Excell EPW1792500 2500 PSI Pressure Washer. There are a lot of reasons to love this unit, but the reasons why I pick this as my top choice is that: (1) it is very affordable; (2) it's ergonomic and has high-quality pump and engine; and (3) it's CARB compliant, so I can guarantee that it undergoes testing and is recognized by the California Air Resources Board as safe and environment-friendly. Each of us has our own preference when buying pressure washer, but the one thing that we all should consider is the appropriateness of the machine to the task we intend to use it with. I always emphasize this to all the other reviews I made, but this time, I want to add another reminder. Always consider your budget. It pays to be more practical these days. The extra dollar you spent on a machine could be used in buying other stuff needed for your home. Hope you find this review helpful. Also, let me know which is the best 2500 PSI pressure washer for you. Comment and share your thoughts below!